The Wife and I tried one last item during our time in Taiwan last month - the Red Tea Sundae. 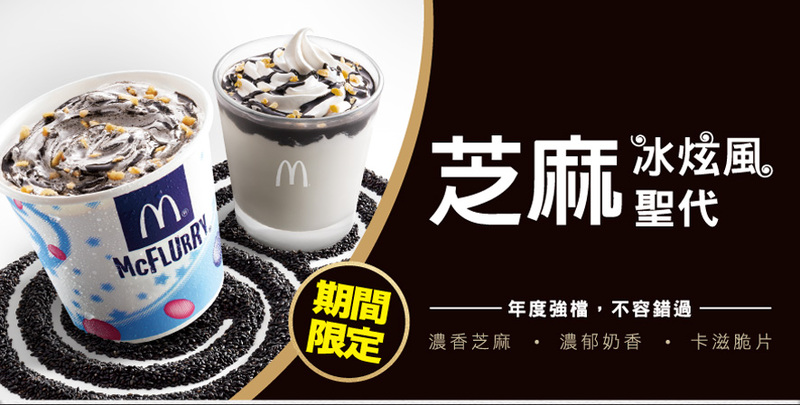 From what I can find online, a Red Tea McFlurry and Sundae launched in early March, at the same time as the Japanese Pork Burger and ran until the end of April, so it had a decent run. To be honest, I had completely forgot about this sundae until I was writing my review for the Curry Burger, since it was far from the best ice cream I've had at McDonald's, and I only had a couple spoonfuls of it. I know I usually go for McFlurries rather than sundaes, but since we were tying two other burgers at the time, so I just went for whichever was smaller and cheaper. It turned out to be a good decision since the Red Tea topping had absolutely redeeming about it whatsoever. The Green Tea McFlurry used to be one of my favourite regular menu items in Korea, and I was very sad to see it go when they discontinued it in 2009, so I had hoped this was going to at least be similar to that. Singapore also had the Himalaya Tea McFlurry a while back which was pretty good, so the combination of tea + ice cream is a good one. Taiwan has some of the best tea in the world, and they were going to be serving it to Taiwanese people, who know what good tea tastes like so I expected this to be very good. Unfortunately, the tea topping on this sundae was chalky and tasteless, and neither my wife, nor our friends could taste any tea in it. It's not like they were skimpy with the topping either, there was a considerable amount on there. The closest thing I could think of to describe the flavour would be if you mixed powdered milk or creamer on top of a McDonald's chocolate sundae. To make things even worse, the chocolate sauce wasn't even hot! 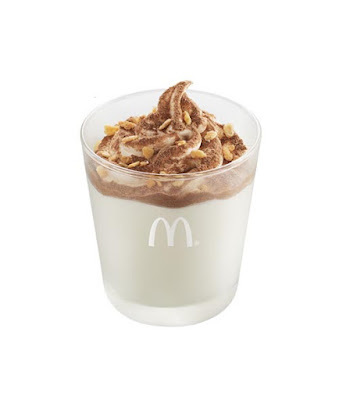 Now that I think of it, do they even still add hot fudge to the basic McDonald's Sundae anymore? I couldn't have had one for over a decade. The "Red Tea" topping added nothing, and since the ice cream was already topped with chocolate syrup and little broken pieces of cone, the additional sweetness of whatever the powder on top was, only made it worse. There were 4 of us and a child eating McDonald's at that time, and we couldn't finish the single cup. McDonald's Taiwan ended up trying to sell these at 2 for the price of 1 at the end of it's run, which tells you that I wasn't the only one that didn't like it. 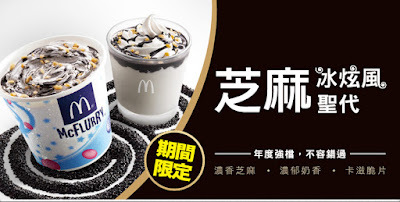 Although in other news, they replaced it with a Black Sesame McFlurry/Sundae Combo, which if it is the same as the one they had in Singapore, won't be much of an improvement. 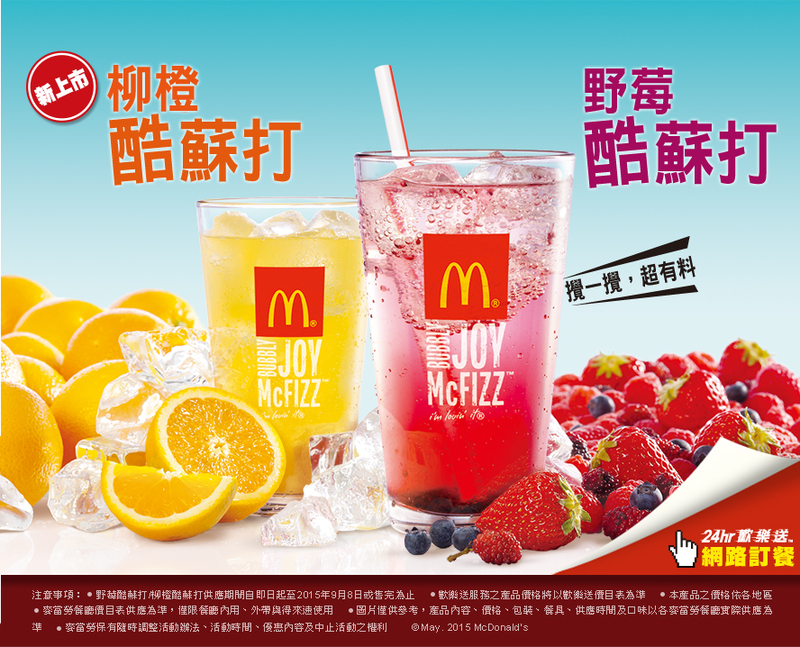 They've also introduced their first ever McFizz. Korea introduced their first a couple months ago, as did Japan, so it wasn't much of a surprise they made it down to Taiwan. 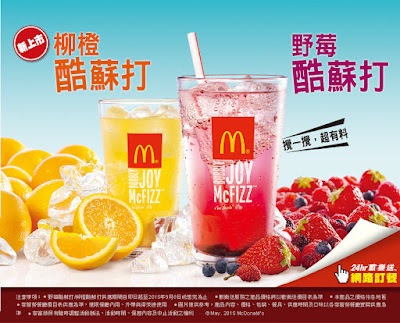 I've already asked my friends in Taiwan to give it a try as I'm interested to see if they use real fruit rather than the syrup like here in Singapore.